STUART WEITZMAN Clip Toffee Brown Leather Platform T-strap Heels - Size 8. In very good used condition. Color - Cognac Tartargua Patent. The shoes have a pointed toe and would be a great work or party shoe. Heel Height - 4". Style - Unknown. Length - 11". STUART WEITZMAN. Marbled Tortoise look. Brown Black Patent Leather. Dress Pump. Stuart Weitzman Nudistsong Black Evening Sandals Size 9M. Condition is New with minor scuff as noted in pictures. Stuat Weitzman. See above for condition along with pictures. New without original box. Wedge height 2 in. Shipped from Canada to US and Canada. Material: Leather. Color: Black. Unless otherwise stated. We strive to describe our inventory to the best of our knowledge. Faux snake leather Stuart Weitzman round toe heels in very good condition, as pictured. There should be no mysteries or surprises here. These have only been worn 2 or 3 times. They are terrific and have been kept in a non-smoking environment. Check out my other listings and thanks for shopping in my closet! There is a small amount of damage to one heel and is visible in the photos. 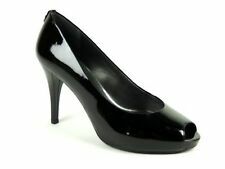 This is for a pair of Stuart Weitzman black patent leather peep toe pumps / high heels in US size 7 M medium. Style 4028652. These pre-owned shoes are in very good condition with only some light wear from light use. Please ask all questions and view all photos before purchasing. Please make sure that your shipping address information is correct when checking out using PayPal, as the address provided is the only one we can ship to. 30 day returns in same condition. Free domestic shipping!. New without original box. Slight marks pn bottoms sole from trying on. Heel height 4.25 in. Shipped from Canada to US and Canada. And we will work with you to resolve the issue. You get exactly what is pictured. Material: Leather Textile. Color: Black. Unless otherwise stated. We strive to describe our inventory to the best of our knowledge. Stuart Weitzman Black Perforated Pointed Toe Leather Pumps Heels Sz 6 m patent . Condition is Pre-owned. Shipped with USPS Priority Mail. Excellent condition. Great for work,church interviews you will be happy with your purchase. Thanks so much for looking. Stuart Weitzman Naughty Pump Stiletto Quasar Candy Apple Red Pointed Toe Heels. Patent Leather. Normal signs of wear on bottom and heel. Very light scratch on upper back left heel. Upper Leather. Leather Lining. Material: Leather Suede. Color: Brown. Size: 8.5 M. Unless otherwise stated. Condition: Great Used Condition. See Pictures for details. Used pair of SW heels in pretty good shape with light wear. Check out the pictures for details. Stewart Weitzman Leather Suede 3” Heels, Gently Used, Sz 8.5.Shipped with USPS Priority Mail. D530 BB1/15/18. Soles show moderate wear. STUART WEITZMAN. Heel height about 5.75"-Platform height at toe area about 2". The shoes are clean inside/out, look great and has lots of life. Material: Leather- Color: Black/White. Size: 9 M US. Stuart Weitzman Black Patent Leather. Peep Toe Stiletto Heels. Heel: 4" (Stiletto ). Toe Style: Peep Toe. Style: Heels. Stuart Weitzman Woman's Pointed toe Black Size 9 Heel 2,5” Slip On Shoes. Condition is Pre-owned. Shipped with USPS Priority Mail. Stuart Weitzman pumps shoes Women’s size 9M Brown leather Shoes are in very good condition, please see photos for more details. Intimates and Sleepwear. Stuart Weitzman. Designer/Label - Stuart Weitzman. Heel Type - Stiletto Heel. Kate Spade. We have a large selection of clothing, shoes, belts and handbags. With over 2000 of the most desirable labels in our inventory, you’re bound to find lots of rare and hard to find pieces as well as common necessities. Stuart Weitzman Black Satin Strappy Sandals With Bow Side Detail Size 6 1/2B. Stuart Weitzman Black Satin Strappy Sandals With Bow Side Detail Size 6 1/2B.. Condition is Pre-owned. Please see all the photos for details of this item. Please message me with any questions prior to purchase. Thank you for viewing this item. Stuart Weitzman shoes are favorites among editors, stylists and celebrities - and it's no wonder. With that they may have light scuffs, scratches, or soil from being tried on to being lightly worn. We do our best to describe the condition. Stuart Weiztman Burgundy Red Patent Pump. Pointed Toe. Ankle Strap buckle. Type: Classic Pump, Pointy Toe. Material: Fabric Upper, Leather Sole. Ladies you know he shouldn't pick out his own clothes. They have been worn. Enlarge photos for details! Material: Leather. Color: Brown. Unless otherwise stated. Stuart Weitzman Slender Pump. About Stuart Weitzman "Slender" is made in Spain. Inside and the top of shoe show no wear! Beautiful Stuart Weitzman Black Suede Heels with Leather Croc heel and platform in Like New Condition. Type: Pointy Toe Pump. Size: US 10M. Material: Suede Leather.